The New Swift M5 series is ideal for educational settings but sophisticated enough for advanced applications alike. 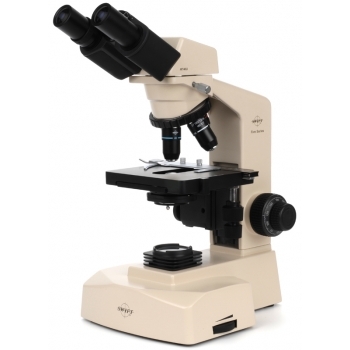 It features outstanding value and performance that is found in higher priced microscopes. The phase model comes with a patented Quodmaster® Condenser lets user dial-in to Darkfield or Phase Contrast with just a click. The standard Siedentopt body is inclined 360 degrees with eyepiece diapter ring and scale. Dual widefield 10x 20mm DIN eyepieces with pointer are also standard. The reverse revolving nosepiece makes changing effortless. The M5 Microscope is equipped with a coaxial "quick-focusing" mechanism that is easier to repair than regular coaxial systems and has a safety device to prevent gear damage. The nosepiece is quadruple 360° revolving reverse-angle. It is configured with Phase objectives that are hard-coated and parfocaled and retractable to prevent accidental breakage of either the slide or front lens. In addition to being UL & CE Approved this instrument carries our "Limited Lifetime Warranty" protecting against defects in materials and workmanship. Click the button below to add the Swift M5 Phase Microscope Series to your wish list.